The Lantern Festival occurs on the 15th day of the first lunar month according to the old Chinese calendar, when a full moon provide enough light for the various ceremonies and activities traditionally held throughout China. Customarily, family members reunite for a meal of yuanxiao, round, sweet dumplings made of glutinous rice flour served in soup, which symbolize a wish for the family’s happiness and good luck all year. 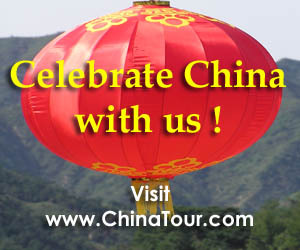 Custom dictates that the holiday be enlivened with lantern hung throughout the house, lantern shows, yangko (a popular rural folk dance), stilt walkers and dragon dances. The history of this merriment dates back 1,900 years to the Han Dynasty when Emperor Mingdi sat on the throne (A.D.58-75). 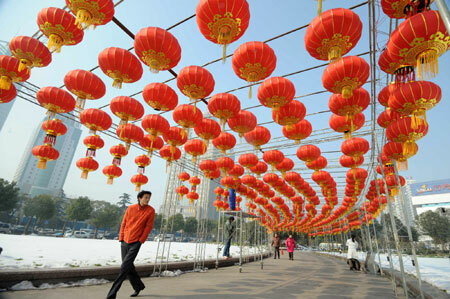 Mingdi ordered lanterns lit in every palace and monastery on the 15th day of the first lunar month in homage to Buddha. 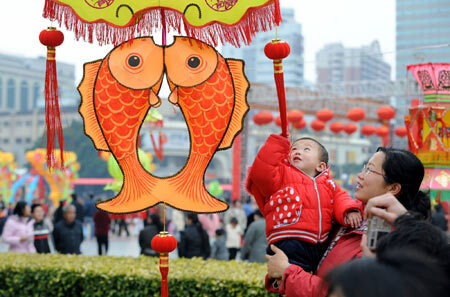 Since then various activities, such as lantern shows, fair, and evening parties to guess riddles related to lanterns, have been organized in different parts of China. The lantern usually are made of thin bamboo strips, straw, rattan, metal or animal horns and are covered with red paper or gauze. They come in various shapes and sizes. 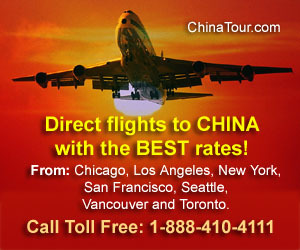 Some are classified as palace lanterns while others are revolving lanterns that feature fables or pictures of animals. 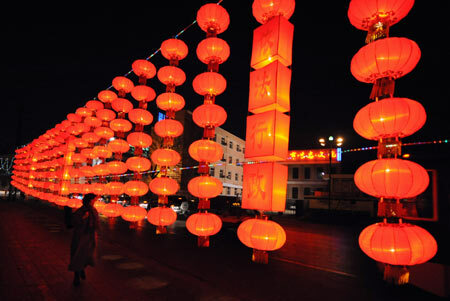 Now technology and electronics are being used in festival lanterns, and neon lights side by side with traditional Chinese paper lanterns add more festivity to the holidays for both urban and rural dwellers. 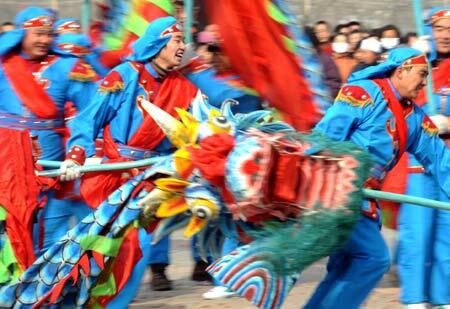 Dragon dances originated with ancient ceremonies for the Dragon King. At first these dances were a prayer for favourable weather. Today performers are more concerned with demonstrating their skills or unique techniques for simulating a dragon. Making a dragon for this dance using colourful paper or silk fabric requires special skills and craftsmanship. Stilt walking, a recreational activity in rural areas, combines dances drama and physical agility. Chinese stilts are usually 20 to 90 centimetres high. Using various props, performers play folk heroes or roles from popular dramas. Yangko is very common folk dance among Chinese in northern China. A yangko can be performed by two or three people who re-create a simple story line, or by several dozen dances who act out complicated dramas. A performer’s sense of humour, plus colourful props such as colour ribbons, paper fans, or handkerchiefs make a yangko a unique cultural celebration, especially when combined with stilt walkers and dragon dances. Round sweet dumplings traditionally are eaten for happiness on the Lantern Festival. Today these dumplings also are a popular dessert in China, and come in two varieties: one is made of white and brown sugar, sweet-scented osmanthus, nuts and sesame seeds; the other has meat and vegetable fillings. Recently Chinese have begun adding chocolate for a truly unique flavour, even though traditional ingredients are readily available in Chinese markets. Besides the traditional boiled dumplings, fried sweet dumplings are becoming popular.